WinX MediaTrans is designed to bring you an entirely new experience in iPhone/iPad media management. You’ll be impressed by its friendly interface, fast file loading and transferring speed, video auto rotation and converting feature. 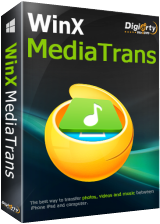 Whether your goal is to get rid of iTunes, free up the space of your iDevice, backup cherished photos, export big 4K videos, or manage music/playlist more flexibly, WinX MediaTrans is just for you. Why is WinX MediaTrans different? 1) Import and auto convert any video to the right format for sync to iPhone, iPad. 2) Reduce big video file size to 50% without quality loss on iDevice. 4) Import/export 4K or 1080p HD videos & films between PC and iDevice, in batch. Turns your iPhone as your free USB. Store Words documents, Excel, PDF and any files.